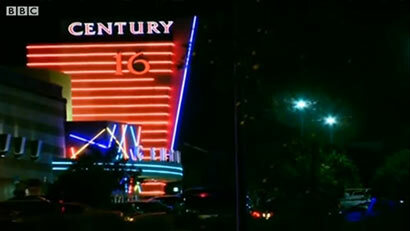 At least 14 people have been killed in a shooting at a Batman film premiere in the US city of Denver, police say. About 50 people have been injured in the incident, police say. Witnesses say a gunman wearing a gas mask opened fire at the cinema complex in Aurora, at a midnight showing of The Dark Knight Rises. There are reports the gunman released a smoke bomb during the incident. Police say they have one suspect in custody. Many ambulances are at the scene. The Swedish Medical Center, not the area’s main hospital, told the BBC it had received three gunshot victims. A witness told 9News that during a shooting scene in the film he heard loud bangs and a lot of smoke and initially thought they were live special effects put on by the cinema. Projectiles came through the wall from the neighbouring theatre screening, the witness said.